Final preparations take place in the machinery hall of the biennial International Woodworking Machinery & Furniture Supply Fair Tuesday on the eve of the show. 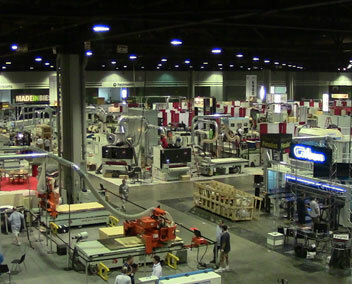 ATLANTA – The International Woodworking Machinery & Furniture Supply Fair (IWF), buoyed by a 40% increase in advance registration attendance, begins its four-day run today at the Georgia World Congress Center. 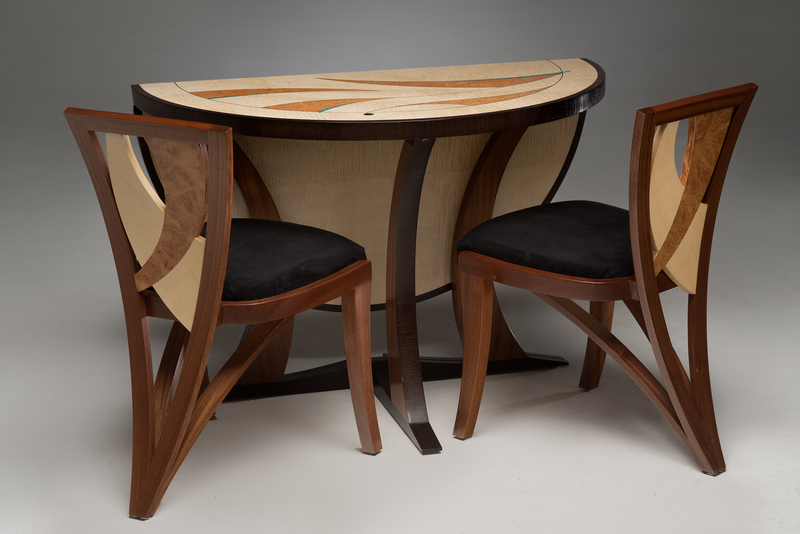 With more than 850 exhibitors, IWF is North America’s largest professional woodworking event. Show management told Woodworking Network on Tuesday that advanced registration had surpassed 12,000 and was closing in on 13,000 – pacing well ahead of the last fair. Approximately 11,000 visitors attended IWF 2010. 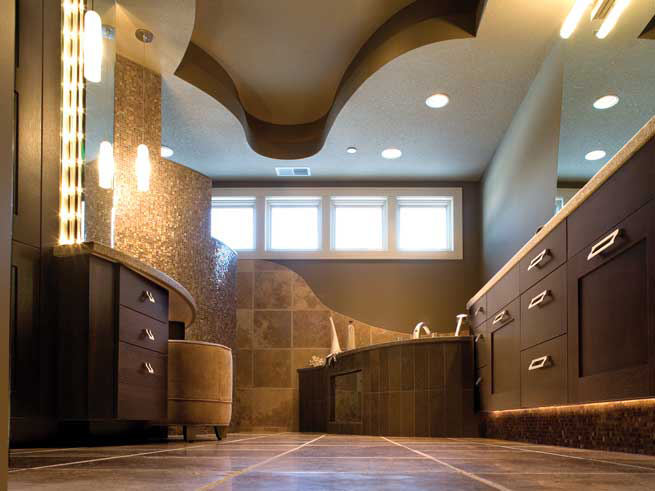 This year’s IWF marks the last in which the American Home Furnishings Alliance (AHFA) is helping to organize. AHFA, which launched IWF in the mid-1960s along with the Wood Machinery Manufacturers of America (WMMA), sold its interest in the biennial show to the WMMA and the Woodworking Machinery Importers Association (WMIA), earlier this year. WMIA became the third partner of the show for IWF 1984. Among the highlights of day one of IWF is the announcement of the winners of the Distinguished Challengers Awards competition. The seven winners, selected from 20 finalists by a judging panel chaired by Richard Campbell, will be presented their Challengers Award statues at a ceremony scheduled for 11 a.m. at the Challengers Award Finalist Gallery located in booth 5000 in Building B.
Woodworking Network, will carry news about the Challengers Award winners, press conference announcements and new product introductions throughout the show. WWN will use its full arsenal of digital media, including video, blogs and continuous news postings delivered through WoodworkingNetwork.com, ClosetsDaily.com, Facebook.com/WoodworkingNetwork and Twitter.com/WoodworkingBIz. The top stories from IWF will be featured in the WoodworkingNetwork Daily enewsletter. In addition, WWN, the official videographer of IWF 2012, will conduct multiple special events at its booth #2429 in Building A. The WWN booth, sporting "The Innovation Sound Stage,” will conduct on-the-spot video interviews with professional woodworkers attending the show, as well as industry suppliers exhibiting at IWF. 3:00 p.m. Wednesday, Aug. 22 – Presentation of WWN’s powerful 2012-13 event lineup, including Wood Tech Summit, Oct. 22-23, 2012 in Vancouver, BC; the new Cabinets & Closets Conference & Expo, Feb. 27-March 1, 2012 in Edison, NJ; and the Woodworking Machinery & Supply Expo, Canada’s largest woodworking event, Oct. 24-26, 2013. 3:00 p.m. Thursday, Aug. 24 – Woodworking Industry Leadership Forum – Several titans of the wood product industry will participate will discuss some of the successful strategies they have used to drive their businesses. 11:00 a.m. Friday, Aug. 24 - Join Bernie Bottens, finishing guru and regular contributing bloggist for Woodworking Network as he solves finishing problems sent to him via twitter.com. Participate in the Q&A at @woodworkingnetwork.biz #BottensIWF. Keep up with all of the IWF action in Woodworking Network’s dedicated IWF news channel.